This is the second and final piece penned as a commemorative tribute to Cde Justice Chidyausiku’s assent to the liberation of the land from the neo-colonial centre of tyranny. 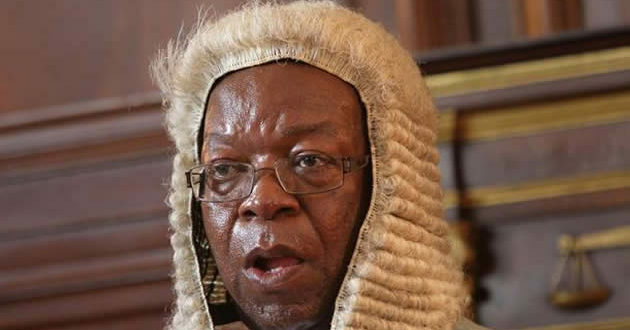 As Justice Chidyausiku graduates to glory he shall be forever remembered for his legal astuteness at the behest of the masses for land to be affirmatively repossessed from those who had stolen it many centuries ago. In the hearts of the revolutionary lovers of this our mother land VaChidyausiku will be forever cherished for how he defiantly chose to challenge the folly of the residual egos of coloniality which were preserved in the decrees which prejudiced the majority’s birthright to land ownership. The very same laws which served as a perennial buffer for the economic progress of the Black rural men, women and children of the land (vanha vevhu) who were reduced to peasantry by the whip of the ugly Land Apportionment and Animal Husbandry Orders. Cde Chidyausiku will be forever remember for his undivided hate of the laws which bartered our humanity for White capitalism which naturally subjected us to be a race of toilers in the White farms. It is these very same laws which couched the superficial human-rights and democracy intellectual discourse and all its bias towards White privilege at the expense of the historical devaluation of the African people. Therefore, mourning the passing on of Justice Chidyausuku in this weekly literary discussion space is relevant because it is in synch with the Land Reform Programme which he marshalled from the country’s top throne of justice. Today we celebrate his ruling on the land disputes as they consummated a new intellectual era whose probe on the national question revolved around the land revolution of the Madzimbahwe. A greater part of this debate on Zimbabwe’s land question and the country’s interface with the rest of the world, the Western world in particular is essential in understanding how the landscape of reason was modified by the emergence of the Zimbabwean land revolution. This revolution is critical as it serves a national memoir of a trying time for Zimbabwe. This was the time Zimbabwe had to confront the reality of international hostility. Some African countries turned their backs against Zimbabwe save for her distinguished patriots who stood for the Zimbabwean idea instead of the idea of Zimbabwe. In this context, the Zimbabwean idea represents the liberation anchored values of being Zimbabwean, while the idea of Zimbabwe represents ideas which were an outgrowth of Western bruises as a result of the land revolution and all its misnamed attributes and its revolutionary intended objectives. While the rest of the world assumed that Zimbabwe’s land revolution was a clumsy display of democracy and human-rights violation, Cde Chidyausiku sat on that bench defiantly asserting the legality of the Land Reform Programme as a redemptive trajectory of giving back that which was lost in the service of imperial interests. Therefore, it was these rare and unwavering credentials — a defiant and consistent personality which defined Chidyausiku. He ran his race to the finishing line right up to his final crown of revolutionary glory as a national hero. As we cherish the memory of his support of the land revolution we need to bear in mind that the question of land is now a think-tank of understanding Zimbabwe’s political culture and the country’s overall intellectual landscape. Therefore, as we reflect on how the land revolution challenged the sustained legacy of imperial conquest it remains critical to understand how the process of land restitution was a medium for aligning nationalism with the post-colonial questions of governance. At the same time it remains critical to introspect the magnitude of the land reform as an agenda anchored on nationalism within the context of the idea of nationalism proximity to the ruling party’s enclave of legitimacy. It is also within that radar of reason that one is compelled to situate the Zimbabwe land revolution within the discourse of pan-Africanism. In the same vein of critically conceptualising the land revolution within an ideological context it is important to understand how pan-Africanism and nationalism have been interchangeably used to justify the people’s land revolution. First, it is important to submit that there’s been silence on the historicity of the role played by Pan-Africanism in influencing the birth of this liberation war souvenir we call Zimbabwe. Apart from being concerned with the global synergy of Africans the idea of Pan-Africanism seeks to consolidate the political and economic empowerment of Africans (Mahomva 2014). Zimbabwe’s colonial uprisings were against political-economic deprivations. Land deprivation was one of the essential factors of this resistance. In the case of Zimbabwe Pan-Africanism was the voice of resistance against oppression and a continuity of the gains of Ghana’s freedom from colonialism — the virgin testimony of decolonisation in Africa. In most instances nationalism and Pan-Africanism have been synonymously intertwined to explain the conception of the African state; hence this calls for a clear distinction between the two and in an attempt to define the nation in light of the Zimbabwe experience one can consider the merging of the diverse groups defined as citizens and as stakeholders in the community-making process. Though merged as a homogenous group these are conservative entities in as much their diverse languages, religions and cultural peculiarities are concerned. Each group has its own unique way of making its own history, with truths and myths varying from one group to the other. Though merged as one all are concerned about maintaining their own uniqueness at any given point. The inevitable consequence of this is the outright dominance of the group with better political and economic advantages over the other groups. This is the reason why the rest of Africa failed to comprehend the urgency of the land redistribution programme as it was perceived as a Zimbabwean project which had nothing to do with the rest of Africa. The narrow (Zimbabwean) nationalist parameters of the land reform programme are the major reason for the land reform programme’s failure to attract absolute support of Sadc. Even back at home this is why the land reform and its rarely mentioned successes are treated as products of Zanu-PF’s success and quest for political legitimacy. This is because we have failed to attach the value of nationalism in explaining the country’s land revolution. Moreover, because this revolution was pioneered by Zimbabwe it will remain a localised success than it is merited within the broader context of pan-Africanism’s undying force to challenge the Western world. On 14 September 2005, Amendment Act (No. 17) of the Constitution of Zimbabwe was effected as a statute aimed at efficiently derailing any judicial alternatives for the historically illegal White farmers’ wish to challenge the liberation of the farms. On 15 May 2006, the applicants instituted legal proceedings in the Supreme Court of Zimbabwe challenging the constitutional validity of Amendment 17, thus delaying their eviction from Mount Carmell. In October 2007, William Michael Campbell launched a plea to the Sadc Tribunal citing cases illegal displacement from Mount Carmell Farm. The Sadc Tribunal went further to render legality to Campbell’s plea from a context of adhering to the human-rights value system. The human-rights value systems which were absent when Campbell’s ancestry looted, raped and murdered the Madzimbahwe. The decision reached by the Sadc Tribunal was neoliberal than it was resonating with the historical condition of the deprivation of the African Zimbabwean. The Tribunal had no empathy of the echoes of discontent of the land hungry Zimbabwean. What was of essence to the Tribunal was restitution of White supremacy over Black interests because the clamor for land in Zimbabwe was viewed as a national concern than it became an exported concern for Zimbabwe’s counterparts across the continent. “It was a Zanu-PF matter!” So was the closure of the file. It is also a fact that the land reform was never supported by our intellectuals. This is why Justice Chidyausuku’s rulings on land grievances were mistaken for pro-establishment bias than they were perceived as rational and in resonance with the historical reality of our dismemberment as a people. It is only a few thinkers like Sam Moyo, Isheunesu Mupepereki and Claudius Mararike who defiantly stood in defence of the land reform programme as a redemptive initiative. Much of the social science research was anti-land reform. This is because less was invested to sustain the intellectual clout of this revolution. However, much was invested to demonise the land reform programme. Even to this day, our intellectuals are vehemently opposed to what the Command Agriculture approach seeks to achieve. This is because most of our people are stuck in the nostalgia of Rhodesian glory. This is the reason why even our economists did not make sense of the possible growth outcomes this particular programme would bear. It is within that context that even our own bankers did not find a lucrative justification for supporting the land reform programme. Zimbabwe’s fast track land reform programme was poorly funded, if it was funded at all, save for the farming inputs from Government. Banks could not give the new farmers loans because some of the farmers could not meet the basic requirements of getting loans (Mathema 2013). A meagre fraction of those who could at least draw up the project proposals did not have adequate collateral attached to their financial requests. Dr Joseph Made, the Minister of Agriculture and Land Resettlement then tried to use public platforms to send rehearsed threats to commercial banks to give the new farmers financial assistance. In reality it was clear that the Government could not by any means shut down any bank for not releasing funds to “unsuitable” loan applicants. In any case there were very low cash-flows into the banking system following the hyper-inflationary environment that had become a key feature of the country’s economy. Above it all, as we fight for better to come I am sure that Zimbabwe will fight until the bitter end as we strive to continue emulating revolutionaries like the late, Chief Justice Godfrey Chidyausiku.